When the waves are running 2 to 4 feet and we have to troll into them or worse, we have to head 16 miles back to the marina and can only manage 12 or 13 miles per hour without slamming the boat down into the wave troughs, I wish we were becalmed. It’s a nautical term invented by sailors on their tall ships. No wind meant no progress and apparently on the ocean, at times, they’d become becalmed and the condition would last for days. some chop on summer morning trips. In the summer on Lake Michigan, it happens to us almost every day. Or at least on many days. Pick a day when the temperature starts out predawn in the low 70s but the afternoon highs are scheduled at 90 degrees or more. Common enough in June, July and August. Such conditions are usually accompanied by winds with a southerly component - winds that blow from the land out over the lake. Such has been the case for the past week and I’ve been experiencing it each day with my busy fishing schedule. Each day we’ve been becalmed and it’s great. In the morning the low temperatures on land pretty well match up with the temperatures on the lake and the lake’s surface water temperature. So when the wind blows, it just blows right out across the water. In fact, devoid of trees, hills, buildings and such, it blows very steady and in short order, and as one continues from the nearshore area to the offshore haunts of the salmon, the waves build from a few inches tall to crests measuring several feet. Some mornings there’s a steady chop, others are quite rough. I deal with whatever comes, knowing the “lake effect” weather will soon ease the conditions. On land the rising sun begins to heat the air and the land. Another hot summer day. On the lake, we may still be wearing a light jacket. Hot air rises, cool air sinks. Us fishermen have the cool air and often, on the shore and inland, they have the hot air. Often, towards the distant shore we see cumulus clouds start to blossom - a sure sign of becoming becalmed. As the wind blows, the hot air rises and simply floats aloft over the cooler air on the lake. We notice the wind and waves subsiding and in a relatively short time, the conditions go from choppy to slick calm. If we were in a sailboat, we’d be becalmed. I smile. It may still be a long boat ride (distance wise) back to the harbor but the Bro will easily cruise at 30 mph on a calm lake and by now, the wind stream we feel from the speeding boat feels great. I’m trying not to start off on a morbid note, but one of the realities of life is that everything is destined to die. Humans spend millions to fight off death. Animals instinctively know how to avoid being killed. Even plants have defense mechanisms that kick into gear under adverse growing conditions. But in the end, it’s the end. Every fish caught comes with a story. Some things die hard. Ever had a weed in your garden that just kept resprouting? Some things seem to tempt their fate daily. Human daredevils can get rich or famous (or dead) from their exploits. Some things just seem bent on destruction. I encountered a steelhead yesterday that filled that bill to a T and gave a couple of fishermen some thrills along the way. One could argue it was the fish’s fate. Others might call it destiny. After all, the reason one of Indiana’s fish hatcheries made the effort to capture it’s parents, care for them until the eggs were ripe and fertile, then nurtured the hatchling from fry to fingerling to big enough to stock in Lake Michigan was with the hope some fisherman would eventually hook up with it. The last fish my group of anglers hooked Saturday morning came with a surprise. I extended the net and scooped the struggling fish out of the lake, ending the tussle. As I lifted the fish into the boat, I noticed a strand of monofilament line in the net along with the fish. “Odd,” thinks me. I try to keep stray strands of mono picked up, and hoped one of my lures wasn’t attached to (or detached from) the extra fishing line. 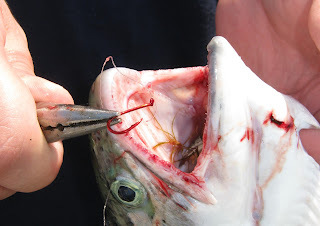 As I removed the lure that had caught the steelhead from the fish, some of the wayward line was tangled in the treble at the end of the spoon. “Doubly odd,” thinks me. I noticed the line wasn’t my line at all. Too thin. Probably 4 or 6 pound test. 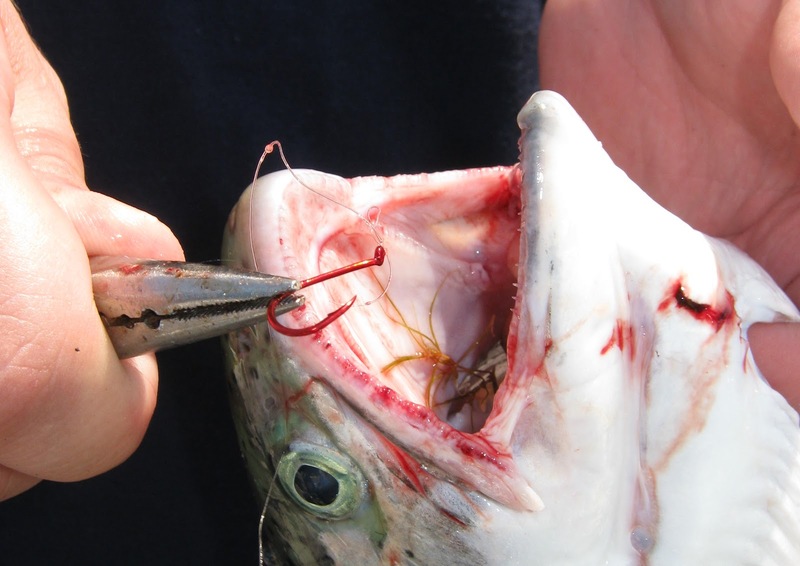 My first postulation was that the hook had snagged onto a length of discarded line, however, I’d think more than a few inches of it would have disturbed the action of the lure pulling through the water and the fish wouldn’t have bitten it. Then it dawned on me to look again inside the mouth of the fish. Sure enough! Embedded inside was a bright red perch-sized hook. clue that it's a part of some other fish story. So this steelhead, destined from birth to die and nurtured from it’s conception to be caught by a happy angler, became a “well-storied” fish. When it bit the perch fisherman’s minnow, it gave him or her a story to tell and a lasting memory. 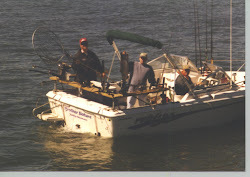 When it bit the spoon trolling behind my boat it gave a tale to the angler who fought and won the battle. In addition, it gave me a story to tell to you, as well. All fish should meet such a well-storied end.